What’s your favorite bar or shop on Virginia Avenue? Chances are it’s a two-story building that used to contain flats or rooms for rent on the second floor and stores on street level. Virginia Avenue is full of rich history and charming one-, two-, and a few three-story buildings. The first two buildings, the Renna and the Bower, are part of the Fletcher Place neighborhood on the south side, commonly referred to as Holy Rosary or Fletcher Place II. The last building, the Hoffman, stands further south on Virginia Avenue in Fountain Square. By the 1880’s, the area around the Renna and the Bower was mostly smaller single family homes and larger duplexes. Even Virginia Avenue was mostly homes at the time, with a few one-story shops. 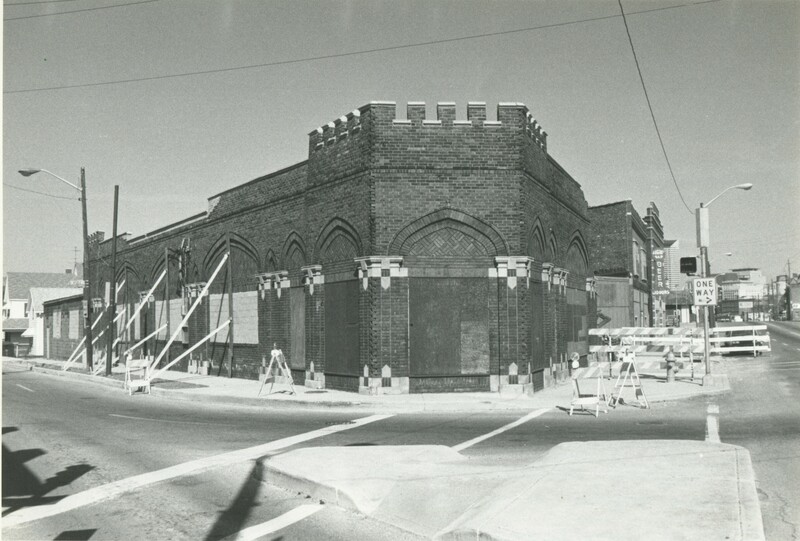 The southern side of Virginia Avenue was almost completely built up. The area north of Virginia Avenue, called “Fletcher Place I” still had some empty lots. There was a boot & shoe store in the future Bower or the building prior to the Bower; also there was a slaughterhouse in the rear. A saloon and a barbershop inhabited the next block to the south. By 1898, more shops started to creep onto Virginia Avenue, making it a new shopping corridor. Many of the homes on Virginia Avenue were demolished for one- and two-story shops. There was also a great deal of additions in the back of homes and also new porches added on to many of the homes in Fletcher Place II. There were two drugstores nearby as well as a bicycle repair store at this time. The shops generally had a very high turnover rate with businesses. The area before the Renna was built was a large house, one and a half stories in the front with a large L-shaped front porch and one story in the back. By 1914, Virginia Avenue was a healthy commercial avenue, with mostly businesses. There was a nickel plating business just to the north of the Renna Flats, and also a theater in the space that currently serves as a parking lot for the Dugout. The Renna, at 613-619 Virginia Avenue, was built in 1911. 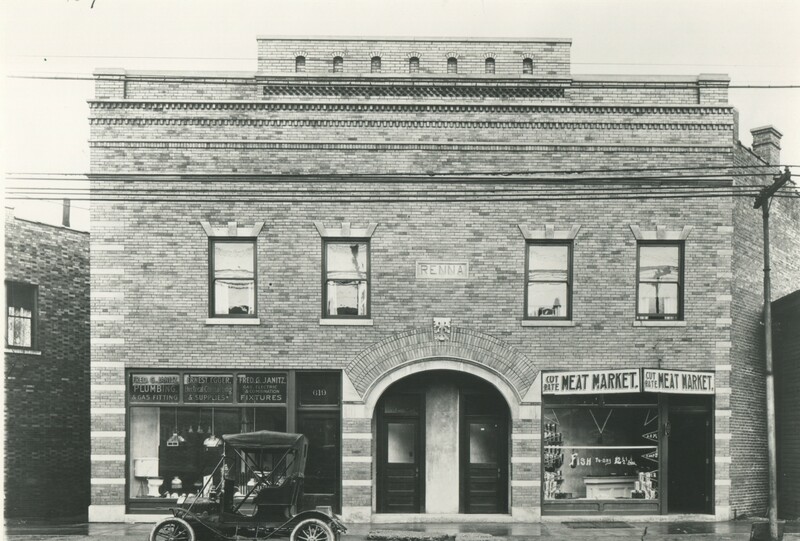 It was home to many businesses including August Pippert’s meat market, F.H. Weldman’s meat market, Styers & McGee’s Feed & Coal Company, a physician’s office, a plumber, a contractor, a dentist and a shoemaker. The area was platted in March of 1911 for William Canfield; three months later, Canfield sold the land to Fred G. Janitz for $1.00 (Indiana Landmarks Holy Rosary Notes). Janitz and his wife, Florence, took out a construction mortgage for $7,000 in October of 1911 – liens following the construction were taken out by Henry W. Trelking ($120), Ernest A. Kottlowski ($100), and the G. Ittenbach Company (Indiana Landmarks Holy Rosary Notes). In 1917, Janitz applied for another construction mortgage for $2,000 – most likely for an addition to the back of the building. In 1920, Janitz applied for a building permit for $9,900 – possibly to re-do the addition to the back of the building, or extend it further on the first floor and perhaps even the second floor (“Real Estate Transfer Record,” IndyStar, 12/31/1920). 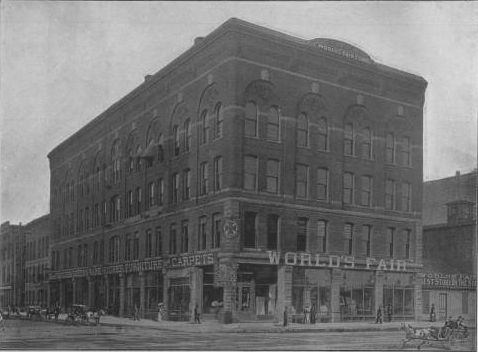 The building was used as a meeting place for the Admiral Baseball Club in 1912 (IndyStar, 3/31/1912). It was also the location of a scandal where two police officers, drunk on duty, chased a man and wrongfully shot at and destroyed some of the windows in the front of the Renna (“Bicyclemen Accused of Drinking on Duty,” IndyStar, 10/9/1913). It was a Halloween store in the 1990’s; today it houses South of Chicago Pizza. The Renna has very detailed and charming architecture. 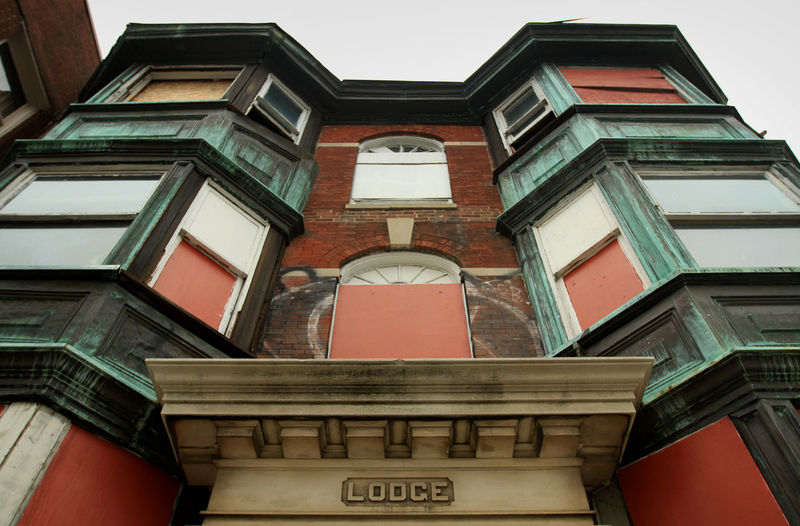 There is quoining on the edges of the façade and around the entry way. Also, it contains three keystones in each window lintel and a large arch and keystone above the entrance (the entrance has been altered slightly). The storefront configuration remains the same. There’s a similar commercial storefront on the side of the building next to the Bower along the alley. 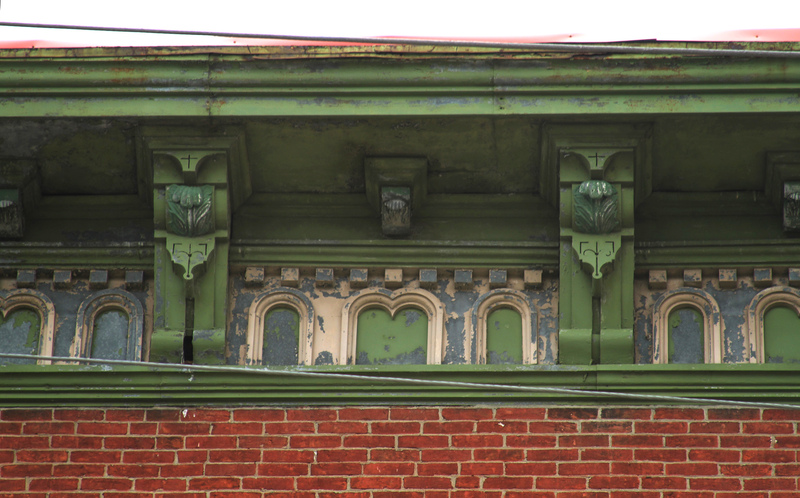 The cornice has many layers of string courses, four full and one partial, and decorative brickwork as well as a parapet. 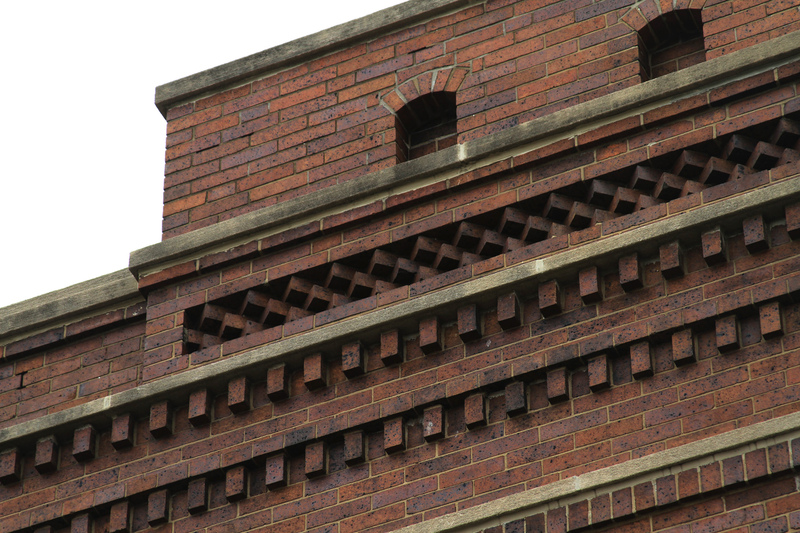 The cornice’s brickwork contains two simple dental courses on the full length of the façade as well as a shorter basketweave-type pattern above. Seven skinny arches top the cornice. The façade is slightly off center, which leaves more questions than answers unfortunately – was this a builder error? Was it platted incorrectly? Lastly, the bricks have a unique red-purple undertone, with evidence along the side of the building appearing as if the bricks were stained a darker shade. 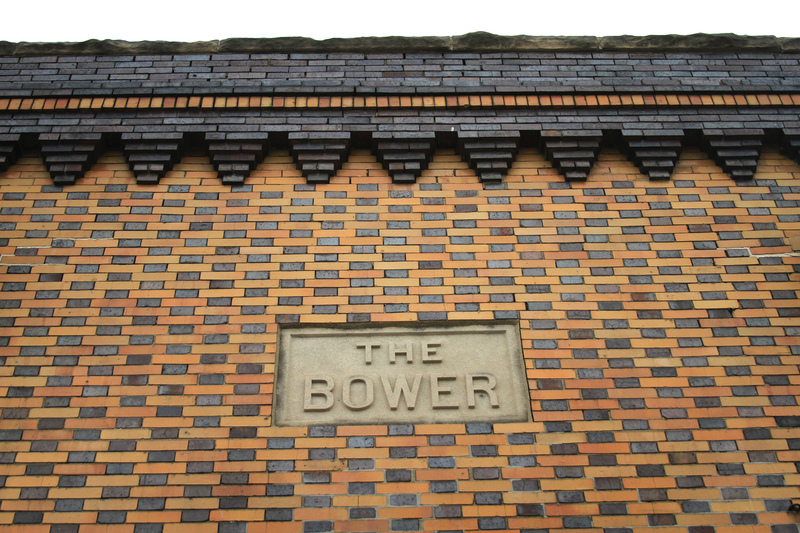 Next door to the Renna is the Bower, at 621-627 Virginia Avenue. In 1887, there was a one-story shop with the same footprint at the location, without the structure being extended in the back. It’s possible that the same building was added onto later or it was torn down with the new structure’s walls in the exact location. Behind that, there was a slaughterhouse in the alley. In 1906, the site was home to clairvoyant, Madame Nagalia, the “great palmist” who could “give advice on business, speculation, reunite lovers, and settle family troubles” for 25 cents (“Advertisement, IndyStar, 5/30/1906). In 1910, a building permit was issued to C. Bower for $200, most likely for a small addition to the rear or for demolition purposes (IndyStar, 6/16/1910). Most likely it was built anew in 1911-1912. 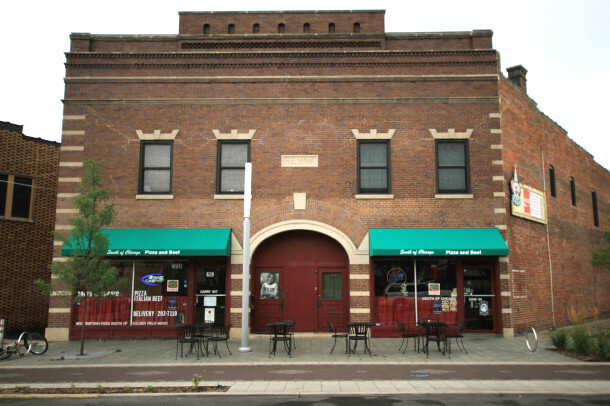 The Bower building housed many different commercial ventures on the first floor, such as a bicycle store and repair shop, billiard room, machinist, and currently the Dugout Bar. The Hofmann Brother’s bicycle shop sold used bicycles for $5-$12 in the northern storefront (IndyStar, 11/10/1913). In the southern storefront, Thomas Wallace operated a billiards room, which he also used as a gambling house. Wallace dealt with the city courts for much of 1914, receiving $10 fines twice and a ten-day jail sentence for keeping a gaming house and also letting minors in the store (“Gaming Charges Result in Fines for Nine Men,” IndyStar, 4/22/1914 & “Poolroom Man Fined and Given Ten Days,” IndyStar, 11/28/1914). Flats upstairs went for $20 a month the following year (Advertisement, IndyStar, 9/19/1915). 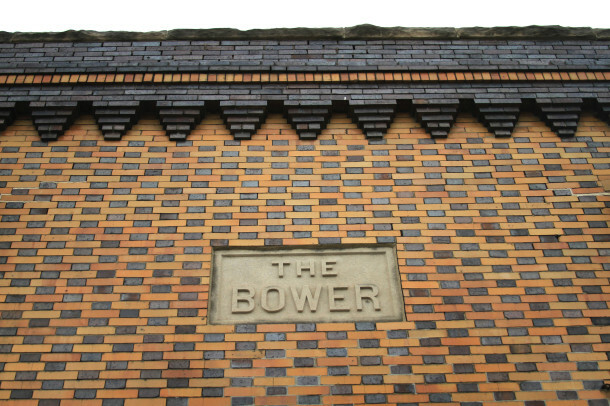 The Bower has lost some of its original architectural features, unfortunately. The commercial windows on the street level have been completely altered, boarded up with wood. It has a deep purple brick band creating a frame around the entire façade as well as the first floor entry and original window area. A sharp contrasting orange brick row cuts through the cornice and all of the purple brick. Similar to the Algonquin, the purple brick creates small pyramidal shapes near the cornice. There’s also a slim stone string course along the top. The distinctive purple and orange brick checker pattern makes this shorter façade unique to the city. 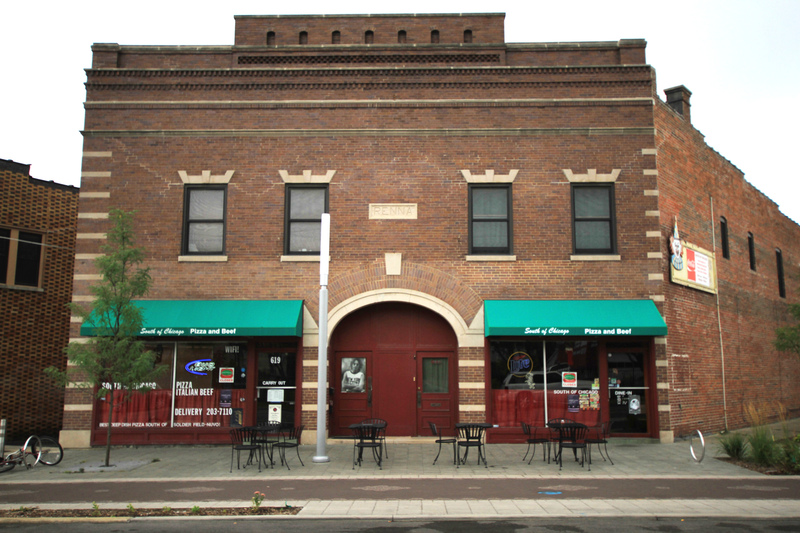 The building is larger than it appears from the front, as it has absorbed the storefront that existed between the Bower and the theater (where the Dugout’s parking lot is today) as well as the area of an old auto shop facing Stevens Street. 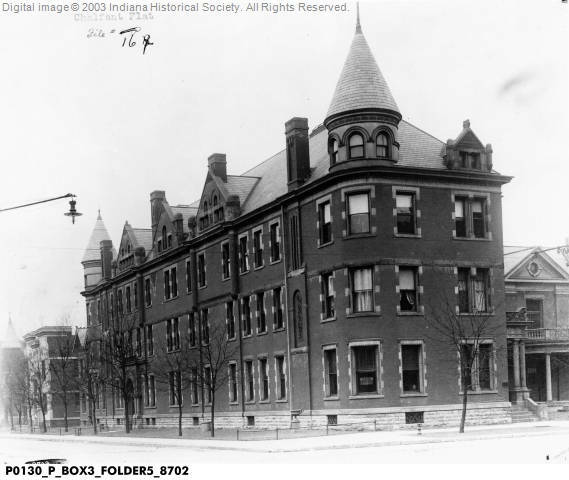 Virginia Avenue was full of life by 1870 – the robust German community, particularly near Virginia Avenue and Prospect Street was such a popular area it had to be platted eight times from 1870-1873 (“Fountain Square Neighborhood, Timeline: 1820-1997,” The Polis Center, IUPUI). By 1880, most of the lots off of Virginia Avenue were full of smaller single family houses – after this time, the largest number of structures to be built in the area were commercial buildings on Virginia Avenue, typically tearing down individual homes that were built long before on the avenue (“The Old Fashioned Way at Fountain Square,” IndyStar, 8/29/1984). The area became a desirable location for theaters, with the first one, the Fountain Square Theater, opening in 1909 at 1058 Virginia Avenue (“Fountain Square Neighborhood, Timeline: 1820-1997,” The Polis Center, IUPUI). This section of the avenue was about half dwellings and half businesses up into the 1910’s. There was a bakery two lots down in the alley, and a bicycle repair shop on the block as well as a drugstore. The St. Mary’s Evangelical Lutheran Church was directly behind the Hoffman flats on Hosbrook Street. Between 1910 and 1950, Fountain Square had more theaters than any other neighborhood in the city (“The Old Fashioned Way at Fountain Square,” IndyStar, 8/29/1984). By the 1950’s, all of the dwellings except two were wiped off of Virginia Avenue on this block. There were two auto sales/repair shops on the block as well as a filling station nearby. 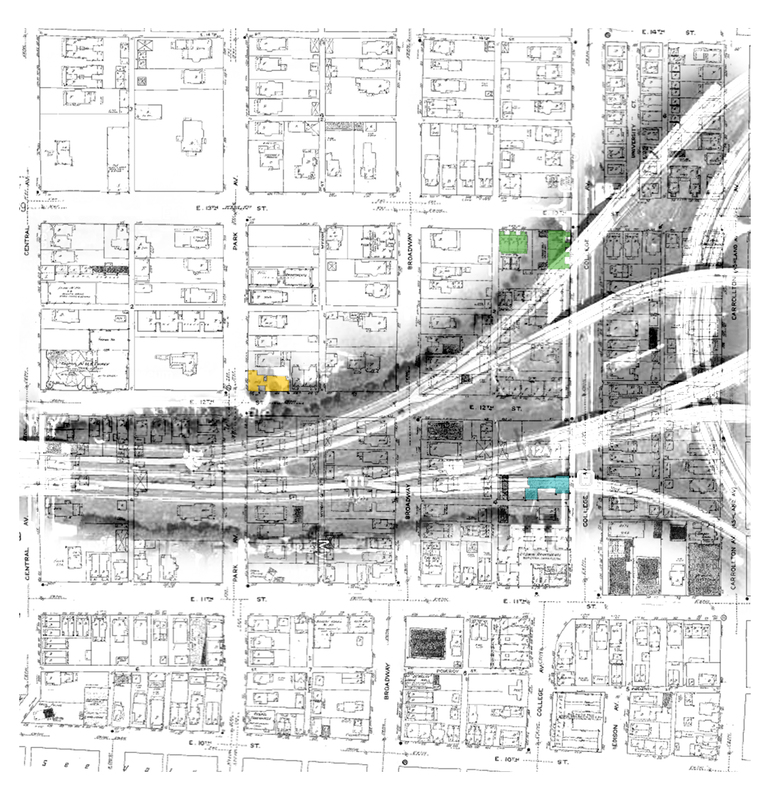 Fountain Square’s population peaked in 1950 at an estimated 27,242; by 1990, the population had dropped to 13,903 (“Fountain Square Neighborhood, Timeline: 1820-1997,” The Polis Center, IUPUI). Since being placed on the National Register of Historic Places in 1983, the area has continued to redevelop and emerge as a desirable location for galleries and restaurants, as well as young families and professionals who want to live close to downtown. 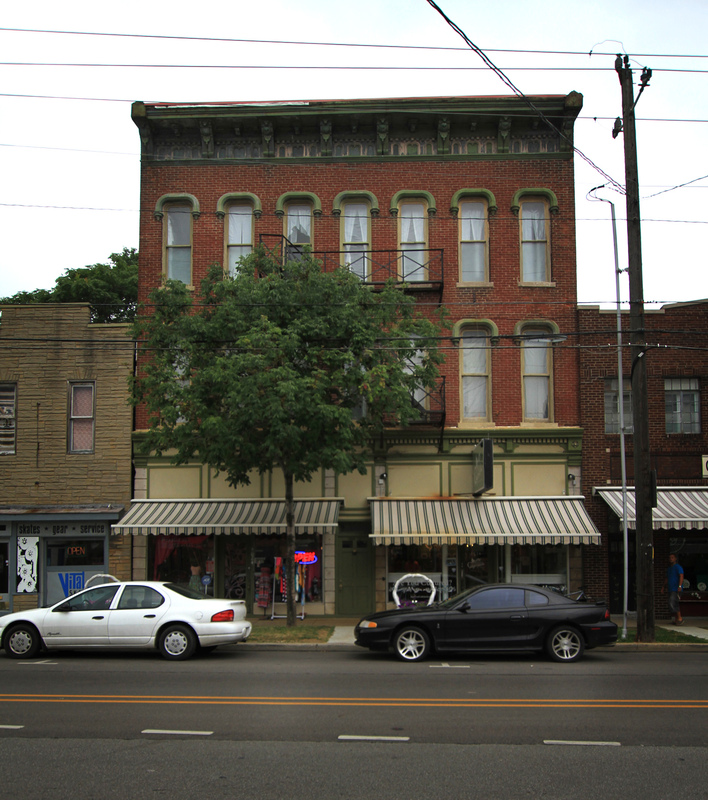 The George W. Hoffman building at 1024-1026 Virginia Avenue is the largest three-story building on Virginia Avenue built in the 19th century. Currently a women’s boutique shop and a frozen yogurt parlor occupy the storefronts, but the building has had a multitude of businesses come through, including a grocery store, shoe store, Laundromat, cigar manufacturing business, and many restaurants. 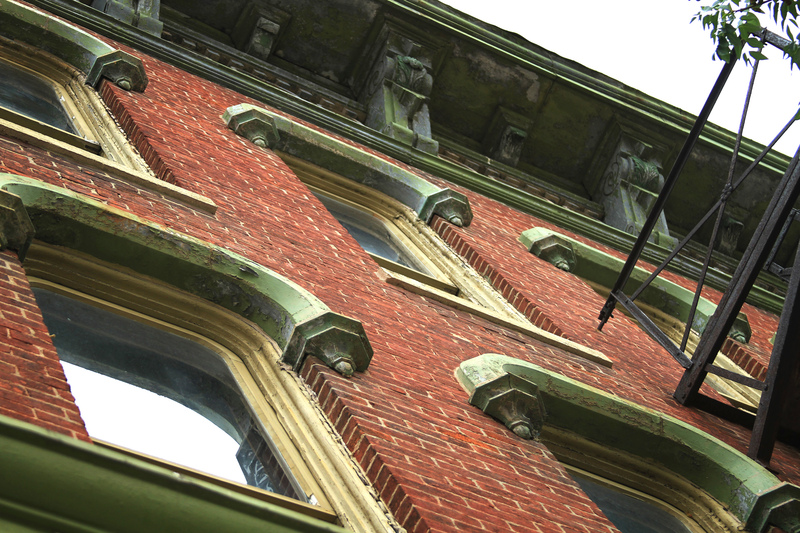 In 1875, Hoffman purchased the lot and built the seven bay wide, brick Italianate commercial/flat type building. 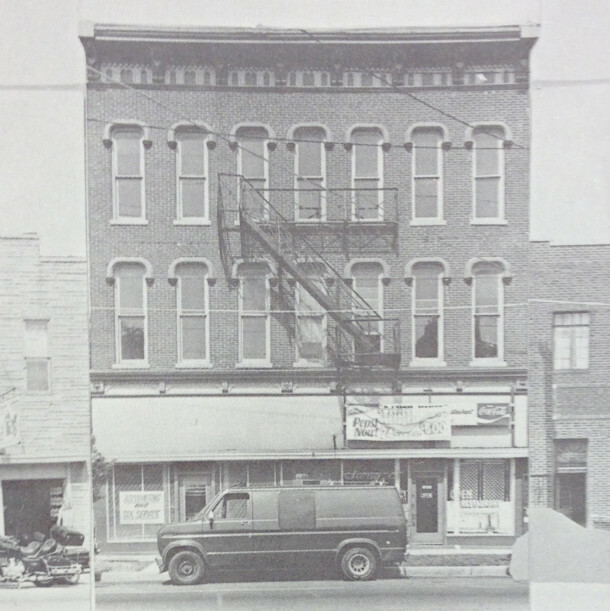 John H. McCollum’s grocery store occupied the southern storefront from 1880 to 1882 before moving down the block (Fountain Square Preservation Plan, 1983). The cigar manufacturing business ran by Edward Anschuetz occupied the northern storefront in 1885 and by 1890 a shoe store was in the other storefront (Fountain Square Preservation Plan, 1983). A catering firm resided in the building in the 1990’s. Hoffman made a career off of metal polish, and before that he had a successful drugstore on East Washington Street; he died in 1909 of “tubercular trouble” at the age of 60 (“George W. Hoffman Dies; Made Fortune in Polish,” IndyStar, 10/23/1909). 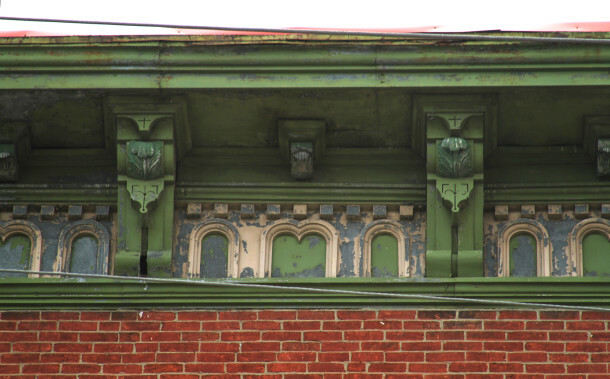 The Hoffman building is one of the most intricately designed buildings on Virginia Avenue. The Italianate structure boasts cast iron window hoods and a pressed metal cornice (Fountain Square Inventory Plan). The red brick building has olive green and cream accents. Dental course trim and small floral accents decorate the façade above the first floor. Fourteen windows, seven on each of the top two floors, have very unique curved geometric window hoods. The window panes themselves are also curved slightly on the top corners. The cornice includes very ornate double brackets with smaller brackets in between as well as dental course trim and slim arches. The first floor storefronts were remodeled sometime in the late 1940’s-early 1950’s (Fountain Square Historic Preservation Plan, 1983). The current owner of the Bower and proprietor of the Dugout is a gentleman named Tom Ford. Tom is primarily engaged in the construction business (Ford and Associates) which is also located in the Bower. Tom and his wife reside in Lockerbie and he has completed several projects there and in other historic Indianapolis neighborhoods. Next time you on Virginia Avenue stop by and see if he’s there. I’m sure he would make a interesting interview. What a wonderful document! Thank you, Jordan. This is the kind of history we need because although these buildings are currently in use and many patronized them, few know anything about them. Your story will help create the kind of identity that Fletcher Place / Holy Rosary and Fountain Square have needed for years. Thank you so very much again! The 7thl photo is a perfect example of an historic building that should not have been torn down for a parking lot. What a shame! Great article. Very interesting history lesson! I love hearing about how many shops have populated the FS and Fletcher Place corridor. Just imagine how bustling Virginia Avenue must have been; first beginning with the horse drawn carriages and ultimately the trolleys carrying people to and from Downtown along the corridor. I would like to mention a possible correction: the brick on the Renna building and in fact perhaps many of the buildings along the commercial corridor likely have their features as a result of the base clay material from which the product was made. Unique clays, such as those used by the Endicott Brick Company in Nebraska (http://www.endicott2.com/FaceBrick-Colors/ironspots/ironspots.html), create very unique colors and textures. In fact they become the hallmark of a particular brick style, especially in the iron-spot type of brick products. There’s another very prominent building on the Indy skyline with Endicott products, and it’s name is Lucas Oil Stadium. I also would suggest that the off-center facade proportions are unlikely “builder error” as you mention. There are so many unknowns in this case that any particular speculation proving true would probably be by luck. I agree that it does seem odd, and from a designer’s point of view, the result is too far from being balanced to be a mistake. Even the Bower building’s facade proportions are off-center, which makes me wonder if it wasn’t done to correct the look of the elevation from an angled vantage point while approaching from the angled Virginia Avenue. Design theory these days is so far detached from those days that your guess is as good as mine. 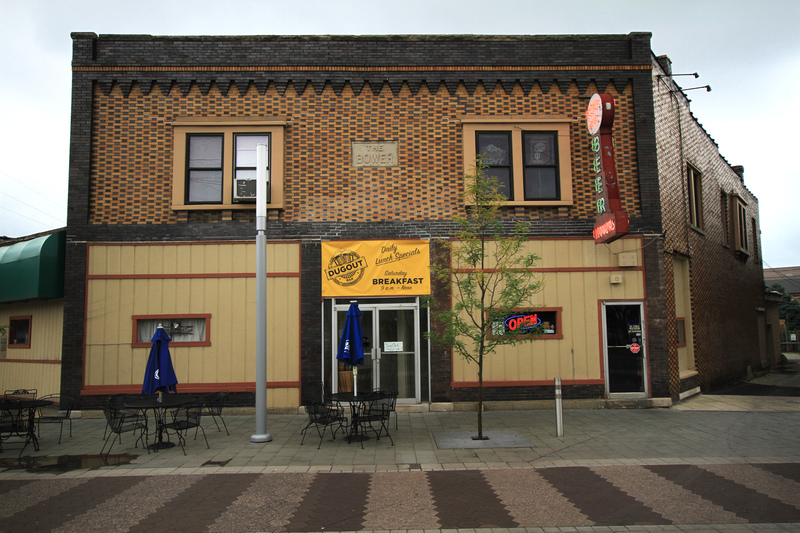 A clarification should be made that little of the greater Fountain Square residential area is designated as historic on the National Register of Historic Places. 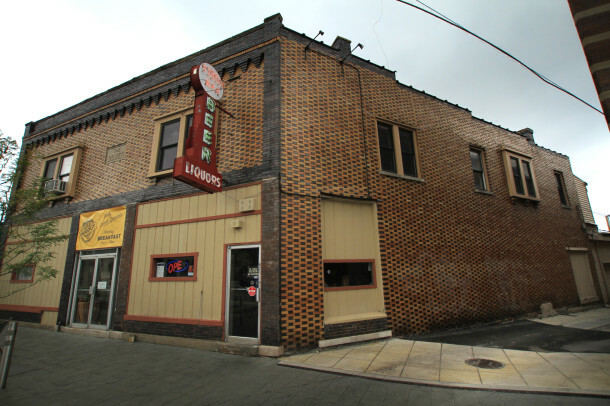 The Commercial District, which is very distinctly defined in the neighborhood plan, is on the Register and all new work in the Commercial District must receive a Certificate of Appropriateness from the Indianapolis Historic Preservation Commission (IHPC) prior to being started. Someone with more knowledge about the neighboring districts (such as Fletcher Place / Holy Rosary) should comment more accurately about their relevance as Historic Districts. Finally, the Hoffman building has one of the most interesting interior lobby’s I’ve seen. For such a small building, the first set of stairs to the second level are comprised of one single run of stairs with no landings going up about 16′. Once at the second level, there is an oval atrium space (now covered over with plywood and relatively dilapidated) extending to what would have been a skylight on the roof “back in the day.” It would have been one of the more unique and detailed interior lobby spaces in its prime. The seventh photo shows the Apex Theater, which collapsed in 1984 during a heavy snowstorm. The photos shows that someone was trying to stabilize it. I remember the evening it fell. We were having dinner, watching the snow come down when we heard a loud “boom.” When we looked out, we could see dust and snow flying. We walked down to Virginia and Pine to see the Apex had collapsed, spilling bricks into Stevens St. and Virginia Ave. So, it wasn’t torn down, it just fell under the weight of the snow after years of neglect. The site really hasn’t changed much since the rubble was cleared. Thanks for the heads up on the Apex Theater demise. That is truly interesting. Just a feature on that theater would make an interesting article, considering how important and central that site has become today, one would think that there would be huge plans for a place with that kind of history behind it.